Comics are by definition a silent medium, but then again, who can read a page of Superman rising to the sky without hearing the strains of the John Williams theme? Perhaps moreover there's a historic vein of counter-culture weirdness in comics that's part and parcel of the same in music, no less apparent than when the creative team of Black Canary Vol. 1: Kicking and Screaming dedicates the final chapter of the book to David Bowie. A team book, realistic superheroics, comedy, and sci-fi are all present in Brendan Fletcher and Annie Wu's Black Canary, as well as a heavy dose of love for music. With all due respect, "Remember that time Black Canary lead a band?" seems prime fodder for a Wizard top ten list, but Fletcher and company make it work, with a Black Canary story that pays as much homage to the pop-irreverence of DC Comics's DC You Batgirl of Burnside as it does Black Canary's military-thriller New 52 roots. I admit I remained skeptical through most of Kicking and Screaming; even as I enjoyed the goings on, it stretched suspension of belief too far that former government operative Dinah Drake should all of the sudden be headlining a high profile band tour. Fortunately about three-fourths of the way through we understand there's conspiracy afoot, and the finale uses some surprisingly complex time travel to explain how much of this was predestined. That's plenty explanation for me, and Brendan Fletcher does well making all the disparate parts of this story feel of a piece -- rock bands, ninjas, aliens, and alt-futures alike. Artists Annie Wu and Pia Guerra both do well, but no small amount of credit for the tonal seamlessness of the book must go to colorist Lee Loughridge, who keeps everything predominantly in shades of muted pink and blue. A comic about the foibles of touring musicians isn't in my immediate wheelhouse, so I appreciated that Fletcher dips heavily into Black Canary's New 52 history as an access point for some fans. Frankly Fletcher couldn't be blamed for jettisoning a lot of that history, including that Dinah was on the run as a murderer, though who she supposedly murdered and why was never made clear. This extends too to her equally murky relationship with Kurt Lance; as someone who actually followed that twisty storyline through Birds of Prey, Suicide Squad, Teen Titans, and Team 7, I'm even more appreciative that Fletcher uses Lance here, and well, too. Lance has been an annoyance for much of the New 52, and in shunting him to the future and positioning him as the unwitting mastermind behind these events, Fletcher simultaneously redeems Lance and mercifully takes him off the playing field by the book's end. The fourth issue guest-stint by Y, the Last Man's Pia Guerra, in which Dinah takes a backseat to the origin of series villain Bo Maeve, in some respects perhaps offers a better indication of what the Black Canary series is about than the other "regular" issues. We can all admit that Black Canary as leader of a rock band is a rough fit; it's equally clear with all the detail here that Fletcher knows of what he writes, and so to some extent Black Canary is two comics, music drama and superhero, smooshed together. The fourth chapter is almost entirely the story of how a young woman tries and fails to make it in the music industry, nearly devoid of superheroics. It's the kind of profile issue Guerra did well on Y, and one intuits a level of comfort on Fletcher's part, not in the least because of how sympathetic Fletcher makes Maeve despite her bad actions and flighty persona. We know by now that this iteration of Black Canary ends up mini-series, not ongoing series, due to the collapse of DC You. And it doesn't seem that the Black-Canary-as-musician concept is getting much play in Rebirth (not at least as far as Benjamin Percy's Rebirth Green Arrow). Given all its unlikeliness, I tend to wonder what this Black Canary would have looked like at issue 50, exactly how far Fletcher could have stretched the band-on-the-road-with-a-superhero concept before it broke. Would we have seen Black Canary become like The Fugitive, where each successive concert stop brought a local problem for the band to solve? 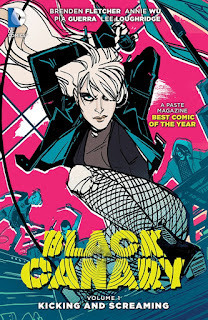 Or is this book's fourth chapter Bo Maeve profile a better indication (and the yet-untold story of band-member Paloma Terrific's family) of Black Canary's future, that at some point the human rock 'n' roll drama would have won out over the superheroes? That's a comic worthy of publication, to be sure, and possibly Fletcher could one day repurpose some of these concepts for a creator-owned work. Black Canary Vol. 1: Kicking and Screaming is light, in some respects, like Brendan Fletcher and Becky Cloonan's Gotham Academy, but I felt more at home here, due most likely to Fletcher's faithfulness to Black Canary's serious roots. If you'd told me the Dinah Drake/Kurt Lance storyline would ultimately be resolved with Dinah's Black Canary bandmates throwing cymbals at an inter-dimensional alien, I'd have been doubtful, but I'm glad to say it all works in the end. Never understood the hate this book gets. 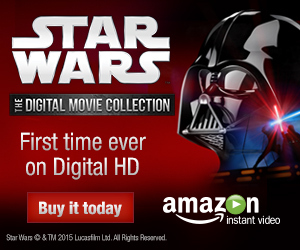 I thought it was a fun diversion from normal superhero stuff. If there's one thing that's really missing from Rebirth, it's this sort of experimental "superhero meets X meets Y" type of books. Young Animal kind of scratches that it, but it's a bit more interesting to see more established characters get taken out of their element. Maybe the hesitation is that we know it's bound to be temporary. Even Jim Gordon as Batman, we knew it wouldn't last, and so Black Canary leading a rock band or Batman opens a fast food restaurant (whatever's going on there), it's good for a lark but hard to get that invested when we know the center can't hold. Batgirl of Burnside, at least, kept the core of the character while altering the aesthetic; that seems to me a more viable way to go. I don't mind those temporary excursions, though. If anything, it means the writers get to experiment a bit more knowing that whatever they do is not bound to permanence. I like it when a run is limited, and gets to end on its natural stopping point. Journey, not destination, etc. I agree, that's how we got Grayson and that's certainly in the top 3 if not the best series from the post-Flashpoint era. I don't think it should happen to often though, but having these from time to time adds that bit of extra fun to a character. I do admit often being a sceptic when I first see a premise like that, but when it works it sometimes is that bit more special. I really enjoyed this book-- it was so different and so fun. I don't mind the contrivance of making a government super-agent into a rock star given how deadly boring Dinah's government super-agent backstory was. (I assume reading TEAM 7 makes up for a crime I committed in some past life, there's no other explanation for it.) I didn't know people out there hated it, though I guess any story with a distinctive voice is hate-able. And that it's actually good! The EP indeed - still available! I'm pretty sure at least one of the songs gets a mention in either this book or the next.